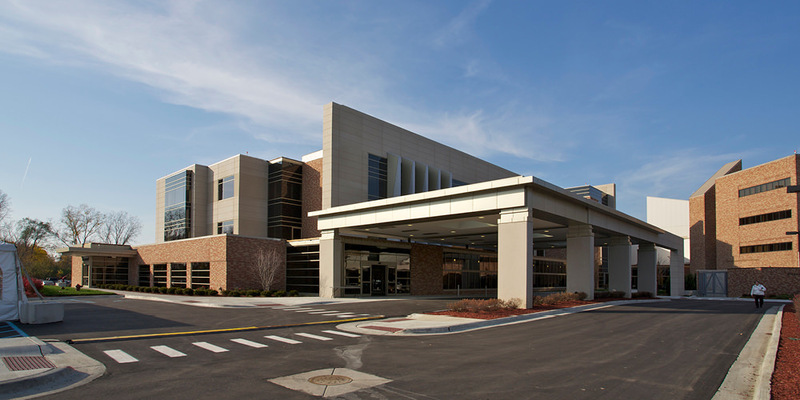 Granger was selected to construct a 150,000 SF three-story addition (South Pavilion) to house a new Emergency Center, a 200-seat auditorium and two floors of private patient rooms. The project also involved renovations to three patient floors in the East Wing of the hospital. An MRI suite, two radiology rooms, four trauma rooms with glass sliding doors,four ambulance bays and seven ambulance parking spaces with outlets to charge on-board equipment. 55 treatment rooms each designed for clinical-specific needs including a behavioral medicine treatment area and Senior ER and trauma rooms. A nurses station, reception area, patient waiting room, six physician sleep rooms complete with a bed, bathroom/shower and TV and a new helicopter landing pad located on the south side of the new addition. A meditation room located adjacent to the Emergency Center designed to nurture the spiritual dimension of patients, families, physicians and associates. The corridor between the South Lobby and the Emergency Center is lined with hand-crafted trees and plants native to Michigan’s landscape to enhance the hospital’s natural healing environment. Renovations to the East Wing included the transformation of three floors of semi-private rooms to 90 private rooms that mirror patient rooms in the new addition. Upgrades to the Central Utility Plant consisted of installing a new cooling tower, chiller pumps, generator, controls and piping to support the additional load placed on the existing system due to the new addition ($1.3 million). Granger self-performed all of the concrete and general trades for this project.